Noic finished ahead of New Cal compatriot and another name-to-watch Clément Colmas at the double downwind-style event held in the north-western region of Crozon, while the continental Frenchies were left to battle it out for the minor placings. New Caledonia, a French outpost in the Pacific just a few hours off the east coast of Australia, is probably the most under-rated downwind hotspot on the planet. The island boasts roaring trade winds, beautiful torquoise waters and a strong paddling community stemming from it’s outrigger (or “va’a”) heritage that make it something of a mini-Tahiti. 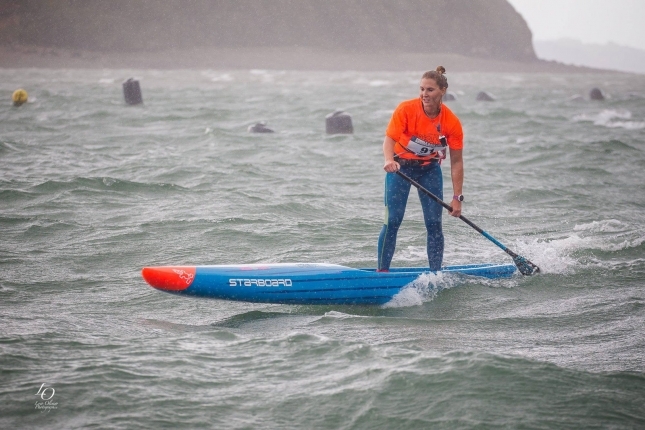 All of which explain why it’s currently home to three of the world’s best downwind paddlers. France has plenty of its own world-class downwind runs as well, with both the east and west coasts offering dozens of prime opportunities. That includes the Crozon region, which served up bumps for days last weekend as the photo below perfectly illustrates. This isn’t the first time we’ve the name ‘Noic’ (pronounced “noo-eek”), with the kid showing flashes of brilliance at the Gorge Paddle Challenge in August where he briefly led the entire field (one of the most competitive ever assembled) before going on to finish sixth overall. His 16-year-old buddy Clément also had a strong showing in Hood River (fourth overall) to back up his breakthrough runner-up performance at Australia’s premiere ocean race, the King of the Cut, last December. Clément from Team Starboard has generally been the stronger of the two kids, which makes Noic’s performance last week even more impressive: he finished over six minutes clear on the combined time sheet including a massive five minute victory on the second run. The Sunova team rider also had an impressive showing at Doheny earlier this month, where he finished a very close runner-up to Ryan Funk in the Pro Junior despite being two years younger than most of the field. And as if there weren’t already enough young guns taking over, one of the sport’s genuine dark horses (not just in France but on the international circuit) finished third at the Downwind Championship: Tom Auber showed his strong EuroTour form and seventh-place PPGs finish were no fluke. Another rising prospect placed fourth, Alexandre Bicrel from Team NSP, while the original French young gun Martin Letourneur rounded out the top five as he continues a return from injury. The ruling triumvirate of French paddling – Titouan, Arthur Arutkin and Martin Vitry – were all absent last weekned, however I’m not sure any of them would have caught Noic anyway. Titou told us the kid has been out-pacing him during some of their training sessions at home in New Cal recently, while Noic’s brilliant form in Oregon highlighted that he’s the real deal. 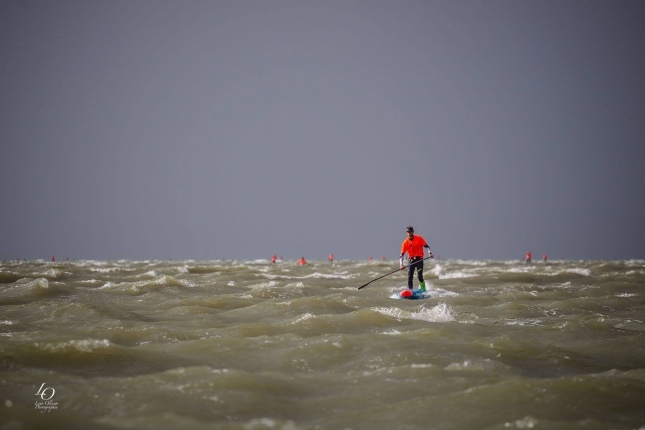 And even without three of France’s finest in the field, last weekend’s Downwind Championship (part of the ‘Presquile Paddle Race’ event) attracted a solid field, with the talent pool in France arguably running deeper than in any other stand up paddling nation. France currently has 12 guys ranked in the top 100, which is the same as Hawaii, three more than the USA and only one behind leaders Australia. Though considering just how fast their juniors are improving – in addition to Noic and Clement killing it in the bumps, youngsters Tom and Martin V were very impressive at the PPGs – there’s a chance France will soon overtake the Aussies. Meanwhile, on the women’s side it was Amandine Chazot all the way, with the Team France representative far too strong for her rivals after Olivia Piana skipped the event. Amandine seems to get faster every race (she finished top 20 in the men’s field last weekend), and although she’s still somewhat in Olivia’s shadows, her solid results show that France has a deep, overall squad that’s extremely tough to match (again, unless you include prone paddling). Unfortunately the women’s field was considerably smaller than the men’s, with an eye-opening ratio of nearly 10:1 (there were 89 guys and 11 women, to be precise). This highlights a trend seen around the world, where women’s participation has either plateaued or simply not kept pace with the growth of the men’s sport. 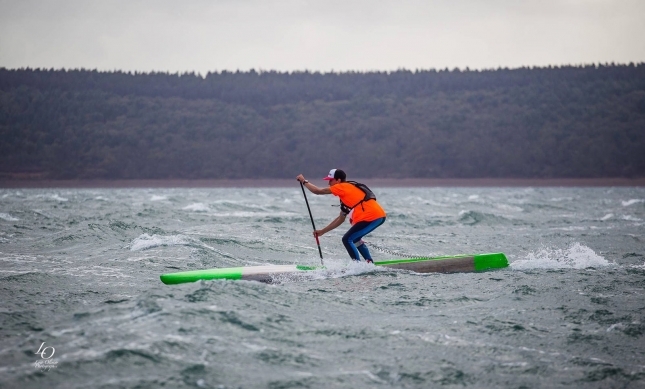 You can find more insights from last week’s race on the French Surfing Federation site, while Europe’s leading SUP media source, TotalSUP, has a replay of the live webcast. Here are the times from the first downwinder plus the overall leaderboard (can’t find times from the second run).